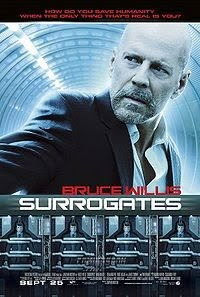 If you step back an d look at the way "Surrogates" was released, it tells us everything that we need to know about what the studio and distributors think of it already. Sure this is a Bruce Willis action thriller movie, but it's being released in late September, almost as if they knew it wouldn't stand as the summer blockbuster it wants to be. "Surrogates" is directed by Jonathan Mostow who was also the writer / director of the terrifically tense submarine thriller "U-571". Mostow followed this up by directing the misguided third installment in the "Terminator" film series and returns to the big screen with "Surrogates" which showed a lot of promise in the trailers but falls flat as the frames unspool onscreen. It's not for a lack of budget or production values, and as a film that is used as an example of the 'Hollywood East' movement it's great to see the city of Boston featured so nicely in a polished up studio feature film. However the slick look of the production can't make up for a lack of chemistry between the script and the cast who all seem to be going through the motions on the way to a paycheck. The creators clearly want to comment on the state of the world today with too many people plugged into their computers and not connected to actual people; however there's too many loose story threads that go nowhere and the whole thing plays like a TV movie of the week. In fact if you watched the pilot episode to "Flash Forward" which aired on television the night before "Surrogates" opened, the big payoff scene for both of them is so similar it will feel like a repeat when you see it in theaters. At least Bruce Willis is looking good at his age and in any of his silly hair configurations, whether its 'metrosexual Bruce' with smooth skin effects and a toupee or 'tough-guy Bruce' with a goatee. Now if only he can find a role that does more than take his face and name for the marquee. "Surrogates" is based on a graphic novel that I haven't read, but I can tell that at some point the creators had a message they wanted to get out and a story that wants to be told. We sense that the authors have something to say with the estranged relationship between Willis' character and his wife, who's real world controller is a another pill-addicted, pajama-wearing, person that never leaves their house like everyone else in the world. But the movie doesn't explore what's really going on and what it means to be these people and the cast doesn't have time to make any impact before moving onto the next scene. As a cautionary tale, the empty hollow experience left behind by the fake plastic people in "Surrogates" is shared by the audiences who watch it, so I suppose in some ways this film succeeds. Hoping this inspires some people to unplug and rejoin the real world for Movie Magazine, this is Purple.